The Indian healthcare sector has emerged as one of the largest service sectors in India. Healthcare spending in India is expected to rise by 12% per annum. An estimate suggests that by 2017 healthcare spending could contribute 9% of GDP and employ around 10 million people. Rising incomes and growing literacy are likely to drive higher per capita expenditure on healthcare. The 20th MEDICAL FAIR INDIA 2014 (MFI 2014), India’s oldest and largest international trade exhibition and conference on Diagnostics, Medical Equipment and Technology, is to be held at Bombay Exhibition Centre, Goregaon, Mumbai, India from March 14 - 16, 2014. This global event is jointly organized by Messe Düsseldorf, Germany (organizer of “MEDICA” world’s largest medical trade show) and its Indian subsidiary Messe Düsseldorf India Pvt. 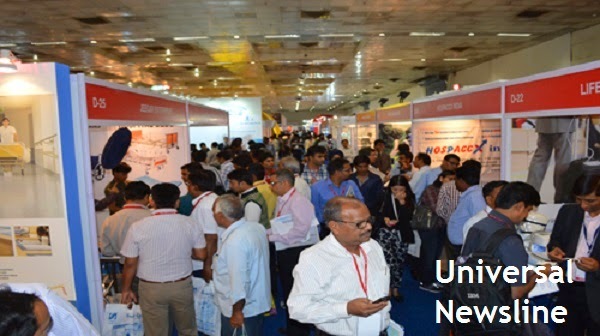 Ltd.
MEDICAL FAIR INDIA is the optimum platform which brings together the relevant target groups from around the globe in order to exchange ideas on current topics, issues and objectives making it the most important international medical event for the Indian market over the past few years. The current edition will have more than 450 exhibitors from over 20 countries with key showcasing of Medical Technology, Hospital Health Centre, Clinic Equipments, Furniture, Laboratory and Analytical Equipments, Pharmaceuticals & Cosmetology, Pharmacy and Dispensary Equipments, Rehabilitation, Components and Service providers. The previous edition held in March 2013 exceeded expectations with some 410 exhibitors from 21 countries and 7,600 trade visitors. The current show is expected to draw in more than 8000 visitors from 22 countries. The Indian Health Care sector is growing at a rate of about 20% annually and will be worth US $ 100 billion by 2015 end. The primary growth areas are the medical equipment segment, Teleradiology or a means of electronic transmission of radiological images such as X-rays, CTs and MRIs from one location to another for the purposes of interpretation and/or consultation, Health Care BPOs, Pathology outsourcing to name a few. Medical Fair, which alternates annually between Mumbai and Delhi, is the ideal platform to meet the “Who's Who” of the sector, to discuss and seal new deals. About 60% of the exhibitors come from countries such as France, Belgium, Malaysia, Taiwan, Korea, the USA and Germany. The fair is supported by Indian associations such as ADMI (Association of Diagnostic Manufacturers of India), MSAHITA (Medical Surgical and Healthcare Industry Trade Association) and at the international level, by institutions such as MREPC (Malaysian Rubber Export Promotion Council), CCCMHPIE (China Chamber of Commerce for Import & Export of Medicines & Health Products), KMDICA (Korea Medical Devices Industrial Cooperation Association), Ubi France, SAMD (Shenzhen Association of Medical Devices), Spectaris, GHE (German Health Care Export Group) and the ZVEI (Zentralverband Elektrotechnik und Elektroindustrie e.V.). Cooperative ventures with Indian hospitals such as Fortis and Apollo Hospitals have also already been confirmed.